Inspired by a romantic ritual, this laser-etched oak frame is a sweet way to display a favorite photo. Carving your initials into tree bark is one of the sweetest ways to declare your love. 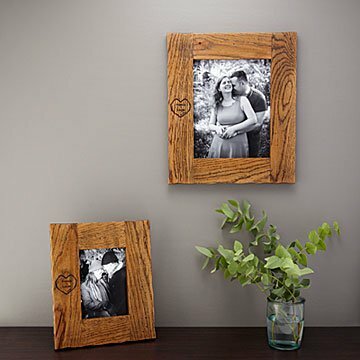 This personalized frame is inspired by that romantic ritual (and keeps trees intact), making it a heartfelt way for couples to display a favorite photothe one where you're both looking darn good. Your initials and special date are laser-etched into the natural wood grain, so no two frames are alike, and the edges are hand-sanded to give them an organic look. It's all finished with a glaze to evoke a tree's natural texture. Made from naturally fallen white oak in Huntsville, Alabama. Careful! Writing is ridiculously small.